Welcome to The Burlington Hotel - quality Isle of Wight accommodation for over 40 years. The hotel commands superb panoramic Ventnor coast and sea views and stands in a quiet elevated position, offering peace and tranquillity for guests desiring a restful holiday. 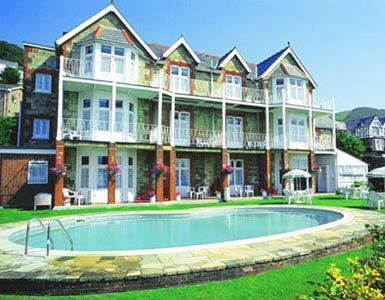 The outdoor heated swimming pool sets the Burlington Hotel apart from many other hotels in Ventnor. Sun loungers are provided for the garden and poolside snacks are always available. Other facilities include central heating, a large car park and relaxing gardens. We are centrally situated for the beach, town centre and all the local amenities. Sporting activities such as bowling, golf, horse riding, fishing and water sports can be arranged. Gloriously sunny and hot in the summer and unusually mild through the early and late seasons, Ventnor is renowned for its mild climate which is due to its southern location and protection from northerly winds by the high cliffs and downland. This makes the Burlington Hotel an ideal holiday destination for the summer, or a cosy atmosphere during those quieter out of season holidays or breaks. All our bedrooms feature private en-suite facilities, plus colour television with teletext, tea & coffee making facilities and direct dial telephones. There is also a fax & e-mail service available if required. Many of our tastefully decorated rooms boast sea views and private balconies where you can enjoy glorious uninterrupted views of the English Channel. A four-poster bedroom is available for honeymoons or those special occasions such as wedding anniversaries or maybe just a special treat. The dining room is a real treat as we pride ourselves in the quality of our food and we always use fresh local produce wherever possible. A full English breakfast is served every morning and a choice from our excellent evening menu with a selection of fine wines from all over the world is an experience not to be missed. We are highly recommended for good food and quality of service and we can provide packed lunches whenever required. is in the Our excellent lounge bar provides the ideal opportunity to meet other guests where you can enjoy a relaxing drink before or after your evening meal or even both!